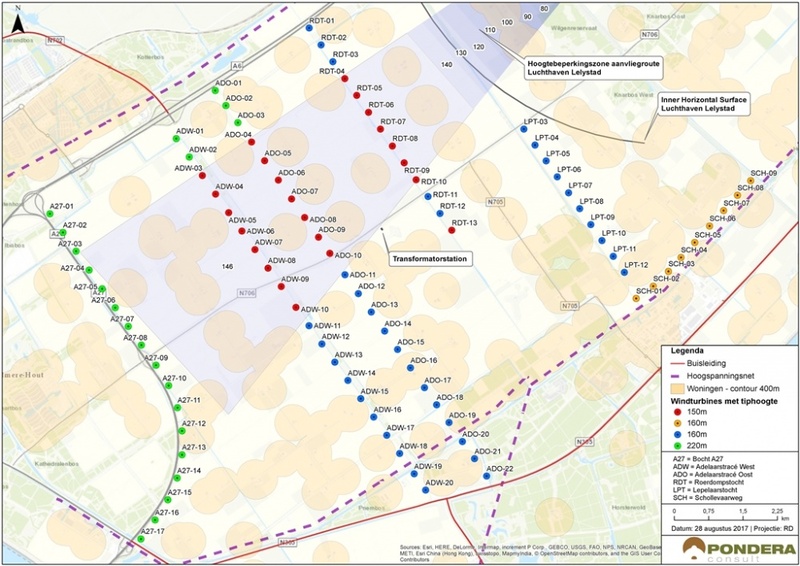 The wind park is planned in Development Area South, northwest of Zeewolde and east of Almere. In that area there are about 220 wind turbines (wind mills), mostly owned by farmers. Most of them were built in the year 2003 – 2004. Zeewolde is the greenest municipality in the Netherlands. The existing mills will be replaced by 91 large mills as from 2020. See the map below. To get an impression of the view of the new turbines, a 360 degree photo has been made at various locations in the area. By clicking on the green button you will see a new screen to view these pictures. The layout of future wind turbines is based on the design plan. The circles around the houses have a radius of 400 meters.